Nearly two years ago, I wrote a blog post about the process involved in creating some of the covers for my books. 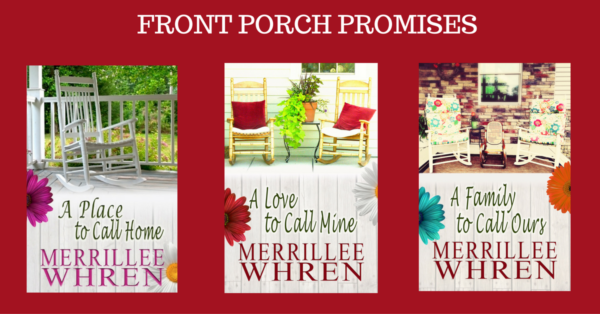 I talked about my traditionally published books and the first two books in my indie series, Front Porch Promises. Here are the first three books in the series. 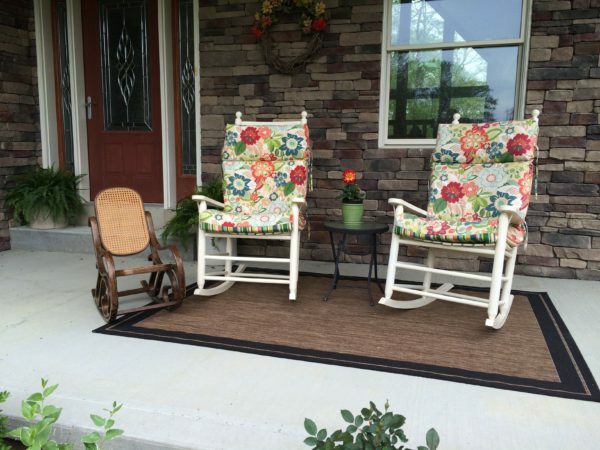 Each book cover features a front porch. The cover for A PLACE TO CALL HOME is how I pictured the front porch of my heroine’s bed-and-breakfast. The cover for A LOVE TO CALL MINE has a porch that resembles the porch of the triple-decker house where my hero shares an apartment with two other guys. The hero and heroine have a few conversations while they sit on the front porch. I was able to find stock photos to use for both of these covers. Then my cover designer put everything together. 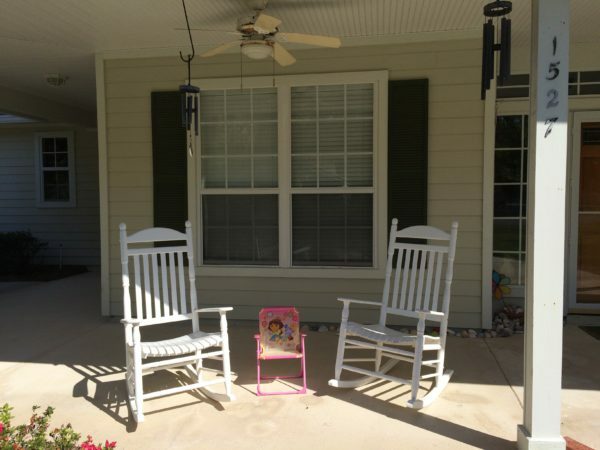 When I started thinking about the third book in the series, A FAMILY TO CALL OURS, I wanted a porch with two adult chairs and one child’s chair because the heroine of the story is a widow with a young girl. I searched and searched for a stock photo that featured two adult chairs and a child’s chair on a front porch. I only found one, and it was a drab, black and white photo that I didn’t like at all. So I wondered whether I could take my own photo to use on the cover. A year ago, we made a trip back to the town where we lived in Florida before we moved to Arizona. I knew several houses that had front porches that I thought I might use. So armed with my camera, I took these photos. I loved the adult chairs, but I wasn’t really happy with the child’s chair, the only one I could find to buy. I had been hoping to find a chair like the one I had purchased for my granddaughter a couple of years earlier, but I found none in any local store. By the time I did find this Dora the Explorer chair, the sun had cast a shadow that made the photos pretty much useless. So I came away without a picture I could use for my cover. A month later we went to Ohio to visit long-time friends ahead of our trip to the Kentucky Derby. 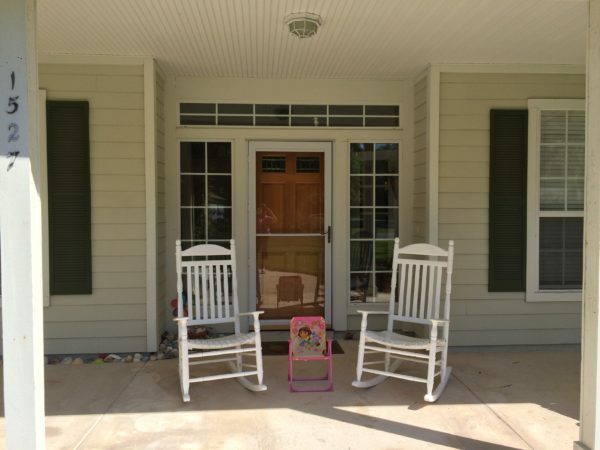 We had never been to their new house, and I was so excited when I saw their front porch. She had two adult chairs. Again I needed a child’s chair. We went to a local store, but again came up empty. While we were going back to the car, we met my friend’s former neighbor. 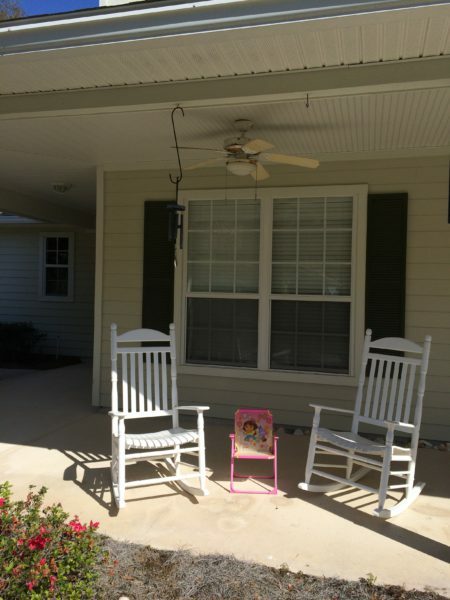 We started talking and discovered that her granddaughter had a small rocking chair. She said we could borrow it. Here are some of the photos I took after we got the child’s chair. I think you can see which photo we used for the cover. I sent the photo to my cover designer, and she created the cover while we were still there visiting. My friend was thrilled to have her front porch on the cover of my book. You may also notice the progression of the number of chairs. Book 1, one chair. Book 2, two chairs. Book 3, three chairs. So is book 4 going to have four chairs? No. Not only does book 4, A SONG TO CALL OURS, not have four chairs. It has no chairs. The book also changes settings. Instead of the story being set near Boston, the series moves to Tennessee, along with the heroine, as she heads to Nashville, where she hopes to realize her dream of becoming a singer/songwriter. But the cover still has a front porch. Here it is. I came across this photo while I was searching for front porches. I knew immediately that it was perfect for this story. What do you think? You can read excerpts for the first three books in the series on my website. A SONG TO CALL OURS will be available later this year. You can get information about its release by signing up for my newsletter. I always have a drawing for special giveaways for my newsletter subscribers. You can sign up to receive my monthly newsletter here. I will be giving away an e-book copy of the second book in the series, A LOVE TO CALL MINE, to one person who leaves a comment. I will draw the winner’s name on May 26, 2017 at 9PM PDT. NOTE: I may not respond to comments immediately because I may not have access to the internet on the day of this post. Back home after a not-so-fun ride through Phoenix. The traffic was awful. Praise the Lord we are home safely. Wemble, I hope you get your porch some day. 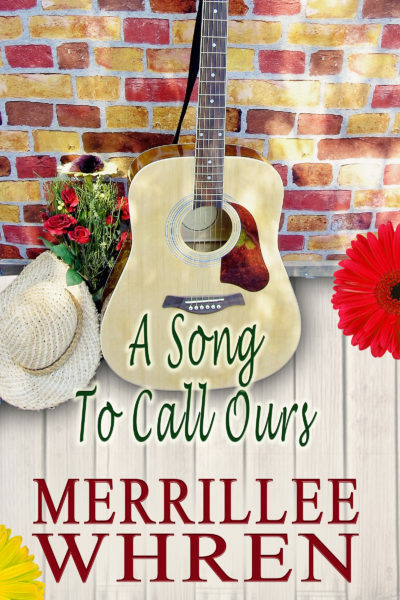 Since I’ve always loved the covers on your Front Porch series, this was interesting to read, Merrillee. The little Dora the Explorer chair is cute, but you’re right, it didn’t quite fit. The latest cover looks great! The hat is a nice touch. Thanks, Jill. It has been fun to do these covers just like I want them. Such a fun thing to be able to use your friend’s porch! Melynda, it is truly special to be able to use her porch. I like your final photo. We’ve been looking at houses and I really like ones with a front porch. Thanks, Diana. 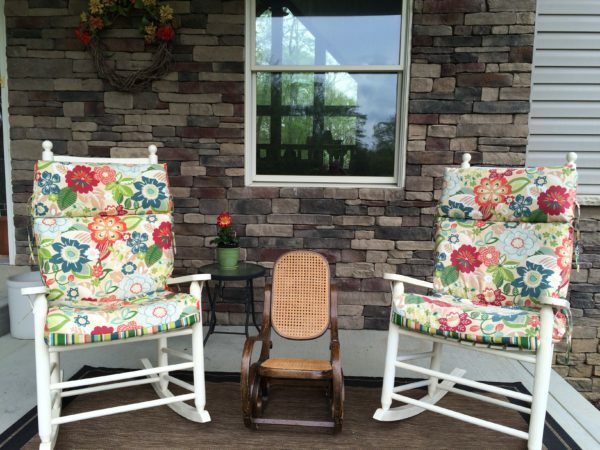 I’ve lived in a lot of houses, but only two had a front porch where we could put chairs. Love your post on how you got your covers. Love the story of the cover of A Family to Call Ours. Cannot wait to read A Song to Call Ours! Thanks, Sally. I’m working on A Song to Call Ours. I almost always have the cover before the book is finished. Love to see the process, and agree on the Dora chair, it didn’t fit. The final one you decided on for the 3rd book is perfect, and I think that last book cover fits right in with that title. Thanks, Andrea. I’m glad you agree with my choice. I always like it when the cover fits with the book! It’s fun to see all the possibilities you worked through. Margaret, I love to make the cover fit the book. I know I would be thrilled to see my porch on a author’s cover. Find the right picture can be exciting and fun but also challenging. I guess end result is worth it. Nice covers for the theme of the stories. Thanks, Colleen. It was truly an adventure. Gorgeous covers, Merrillee! Love how your persistence creating the right image paid off. What an interesting process! Your covers all go together so well in that series, and now I see why. I love the covers, Merrillee! I love big front porches. I have one that goes all the way across the front of my house. I also have a back porch to match. I love to sit out on them in the evening and enjoy the view or read a book. Winnie, big porches are made for rocking and reading. Such an interesting process. I love behind the scenes looks like this. Thanks for sharing. Thanks, Jessica. I’m glad to share the process. I love knowing how covers are made. These are fabulous! Love all of these beautiful covers and they go together well. I love all your covers and the progression of chairs! I am always amazed at how book covers come into being. Thank you for giving us a glimpse of yours! Thank you also for the giveaway. Good luck to everyone! Thanks, Robbie. Creating the covers is fun. Your covers are always beautiful! I love the front porch covers. They are beautiful. Merrillee, I enjoyed reading how you found the right chairs for your cover. 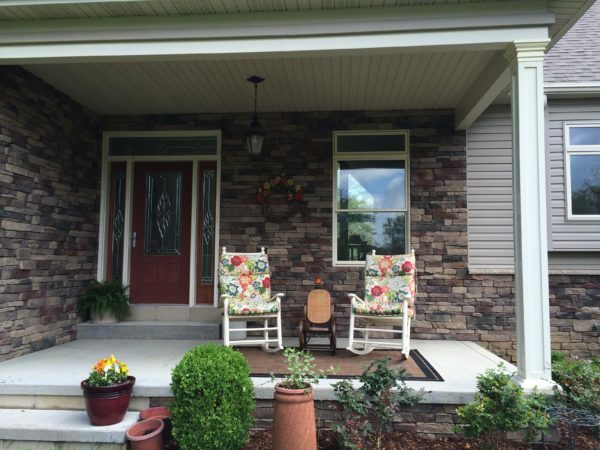 I loved the beautiful front porches and it makes me eager to get out on our porch. Thanks for sharing. 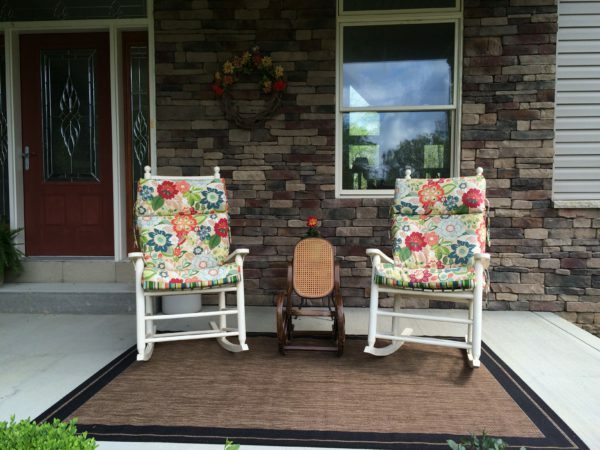 Connie, I’m glad you enjoyed my journey in finding the right porch and the right chairs. You are very welcome, Janie.